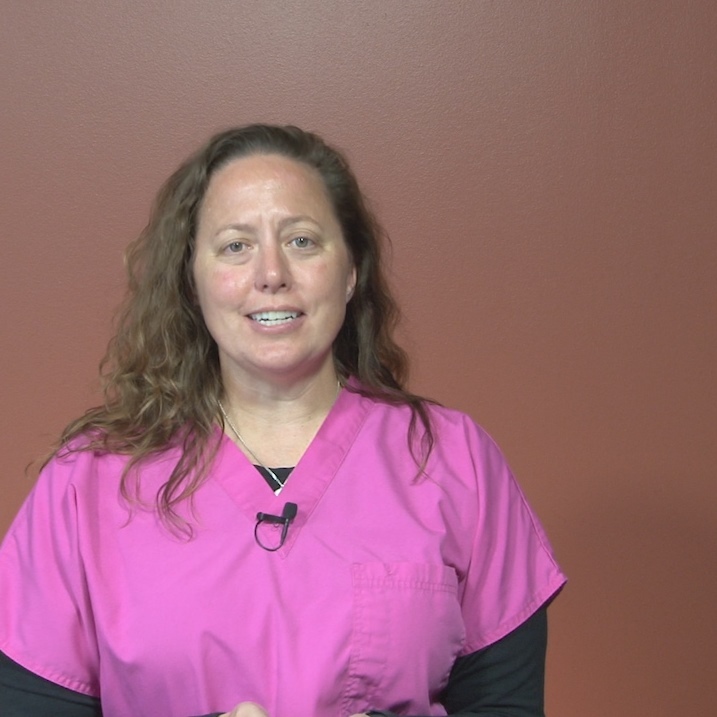 Joanie Abrams, CVT, VTS (ECC) reviews the steps to placing an Intraosseous Catheter in a patient. Bones used for intraosseous infusion should be intact (not previously fractured or used for IO placement within the last 48 hours), and the skin over the site should be healthy to avoid contamination with bacteria. Complications are rare but include extravasation, bone fracture, malposition, damage to growth plates (neonates) and osteomyelitis. Most complications are outweighed by the urgent need for vascular access and can be avoided by following the procedures for sterile prep of the area and appropriate location choice. The first two sites are generally the easiest for palpation and placement, for experienced staff and newer techs alike. However, there are other areas available for placement, especially if your practice wants to invest in a placement device, like an EZ-IO, that makes placement even faster with a short needle and an assisted drill. For now, this instruction will focus on manual placement, since that can frequently be accomplished with supplies most practices already have on hand. In small patients, like neonates or exotics, the cortical bone is soft enough that you can typically use standard hypodermic needles (22 ga to 18 ga). 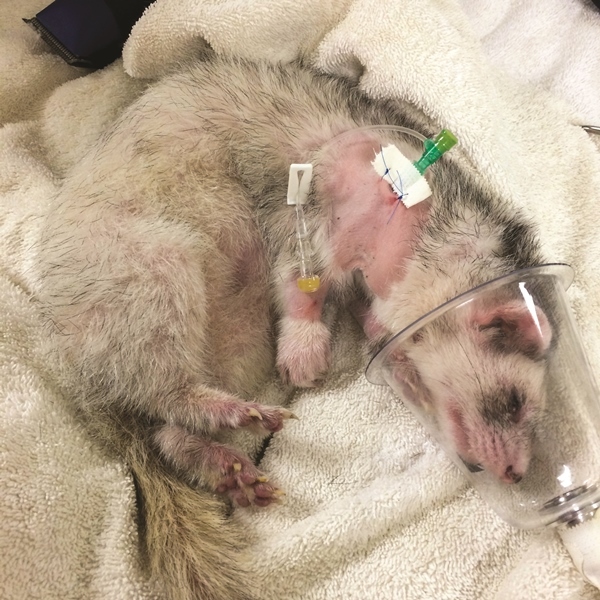 In mature animals, there are commercial intraosseous needles, spinal needles or even catheter stylets that can work in a crashing patient (18 ga). Sterile prep of the skin should be performed at the selected site. Clip away any hair and prepare as you would for any aseptic procedure. Wear gloves during placement. Attaching the needle intended to use for placement on the end of a 1 ml syringe gives additional area to grip and leverage while maintaining aseptic technique. The most painful part of placement is the introduction of the needle through the periosteum of the bone. This can be avoided by having your patient anesthetized or by placement of a lidocaine local block from the insertion point and down into the periosteum. Wait 30 to 60 seconds after local block before attempting placement. Making a small nick in the skin with a blade or needle can help reduce resistance while passing the needle. Using your non-dominant hand, hold the bone intended to enter. 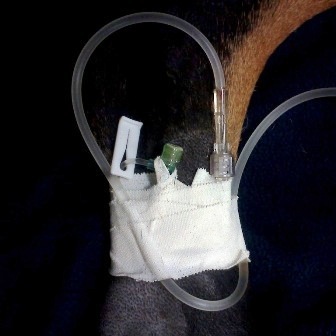 Rotate the limb externally to provide more exposure of the point of access. Touch the needle down to the bone perpendicularly. The initial cortex is firm and requires some pressure to get through. The needle should enter the bone down the medullary cavity, much like an intramedullary pin. As you push the needle into the bone using your dominant hand, it can help to twist the needle while pushing and avoiding lateral movement. Once the needle has been pushed through the cortex, there will be a loss of resistance with a sensation like scraping the needle over sandpaper. If using a spinal needle or IO catheter, you can remove the stylet at this point. When using hypodermic needles, there is a chance that you can core the bone and get it lodged into the lumen of the needle. This can be dislodged with gentle flushing, but, if not, the needle can be carefully removed and a new one replaced down the same tract. The needle should be aspirated, flushed with saline, and attached to a T-port. Placement should be confirmed by flushing before each use. The needle can be sutured in place to avoid becoming dislodged with movement. Bandaging the area can also avoid contamination by the patient during longer term placement. Confirmation of proper placement can be made by flushing with saline. It should flush easily, and there should not be an accumulation of subcutaneous fluid in the area. When the limb is moved, the needle should move with it and feel firmly seated. If time allows, placement can also be confirmed with two view radiographs of the limb. All fluids, medications and even blood products can be administered IO at similar rates to IV access. In conscious humans, there is mild pain experienced at the start of an IO infusion, so many practitioners have written into their protocols to give a small bolus of lidocaine slowly over 30 to 60 seconds before starting the infusion. When ready to remove the IO catheter, simply remove the bandages and suture and pull the catheter with a twisting motion. Typically there is no leakage after removal and no long term effects of placement to the bone. Klamarias, L. The intraosseous infusion. Lecture: World Small Animal Veterinary Association World Congress Proceedings. 6 Oct 2004. Robben, JH. Intraosseous catheters. Lecture: International Veterinary Emergency and Critical Care Symposium. 18 Sept 2015.